It's Almost the 20th of March! Here we are, creepin' up on the 20th again! Remember, the 20th of each month is a special day at Bear Patch. Because we are turning 20 this year! Were you around the store 20 years ago?! There's a few folks who have been true blue fabric friends since Day 1, back in 1997, and still love to pop back in to Bear Patch for a good fabric and friend fix. I, personally, shopped at Bear Patch when it was still very new. 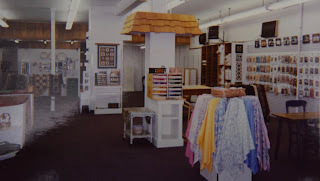 I had occasionally been to Reed's Drug Store in White Bear Lake, where the basement was a fabric shop, and I even remember taking a class to make a doll of some kind. That was a pretty popular idea back then, and it carried over to the new Bear Patch Quilting Co. Some of the people working at Reed's when it closed decided to join forces for a new quilt shop. 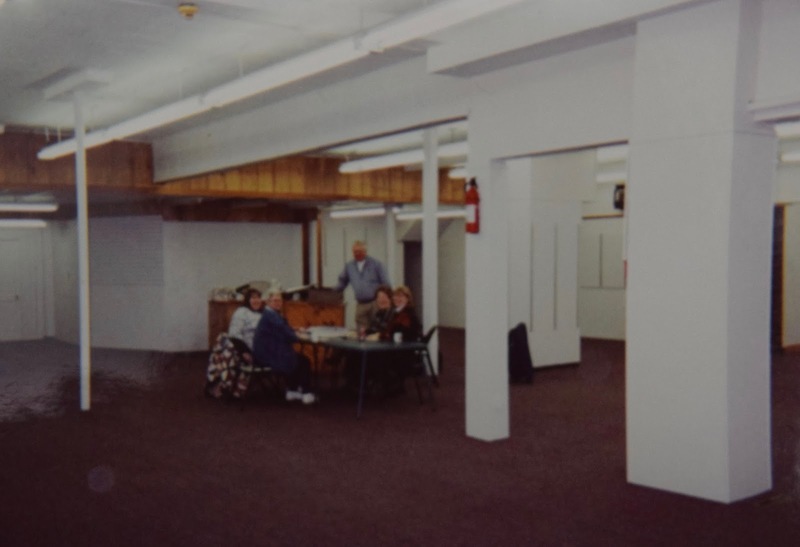 Yes, we had dolls and "Folke Painting" in 1997! You might remember when it looked like this. But back to the ongoing anniversary party! Best Press Gems-- a 2 oz. sample size. Best Press Spray Starch and Sizing Alternative --There hadn’t been a new product for ironing in years - and I got sick and tired of using that spray starch in an aerosol can! 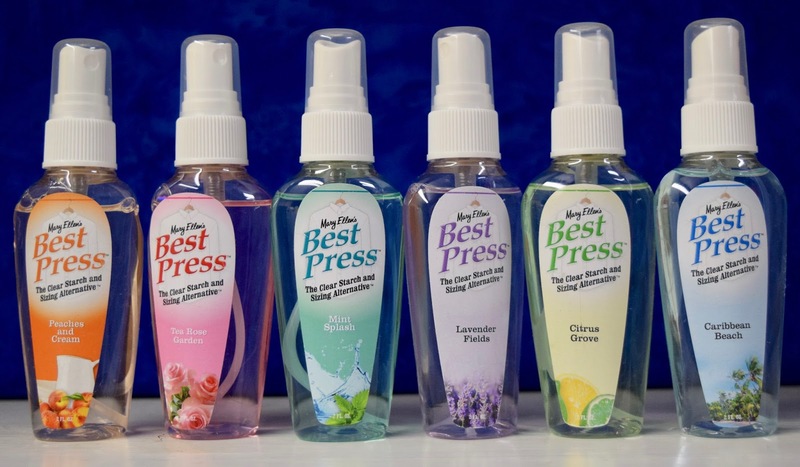 So now I bring to you Best Press, a clear, crisp spray starch with a lovely scent that makes ironing more enjoyable. It’s in a non-aerosol bottle, so it’s environmentally friendly and you can see how much is left, too. With Best Press, there’s no flaking, clogging, or white residue on dark fabrics! And more! A special stain shield protects fabrics, and the product helps resist wrinkles. Best of all, it’s more effective than any starch you’ve ever used. 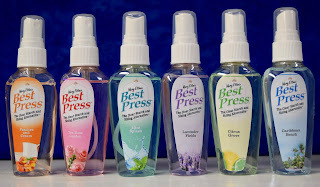 Try Best Press today - you will never go back to ironing with ordinary spray starch! Try all of my wonderful scents! Lavender Fields •Citrus Grove •Linen Fresh •Caribbean Beach •Cherry Blossom •Tea Rose Garden •Peaches & Cream •Mint Splash and, for those who prefer no scent, try my •Scent Free! Mary Ellen's is a local company, and we like to shop local! There's a story behind the company about the woman who started on a shoestring and built a successful business. Click on this link to learn more about it! We love our Best Press, and we keep it handy to use at the store for our classes and projects. It has become a staple in our inventory, and we are happy to be sharing a little bit of that love with you! So don't be late, come to Bear Patch on Monday from 9am - 9pm. No purchase necessary, just show up for the gift! Quilting Inspiration Is All Around You! We have a special event planned for you! We know how enjoyable it can be to sit down with others who like learning about the same things that you like, too. We have invited a special guest to join us for a chance to explore inspirational ideas that transform our quilting lives. Where do you get your quilting inspiration? 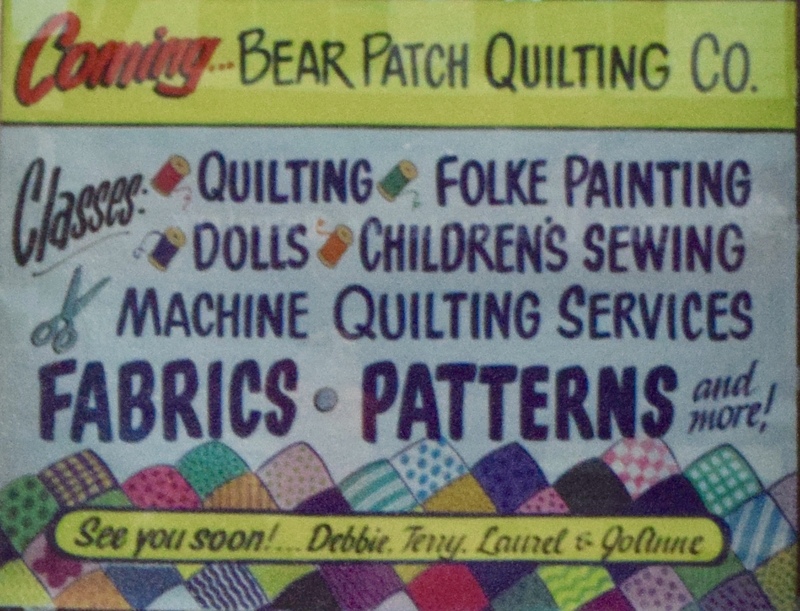 Nina McVeigh, Bernina Educator, Quilting and Longarm Specialist, is spending time with us on Tuesday, April 11. You can choose to attend either the 1PM - 4PM session OR the 6PM - 9PM session at Bear Patch. Nina turned Swiss inspiration into quilted art. Let her guide you through the techniques for creating six inspired quilt projects. 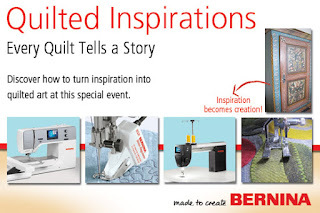 Celebrate the best in quilting technology and Bernina accessories. Discover how easily you can execute your own ideas. Every quilt tells a story, and you will be inspired to tell yours! Topics covered will include: Bernina cutwork techniques, machine applique, double needle stitching techniques, Bernina stitch regulator, binding techniques, simple piecing with Bernina dual feed, and the Q20 sit down longarm machine. We will have prizes and goodie bags ready for you, as well as refreshments. There is a class fee of just $25, payable with registration. 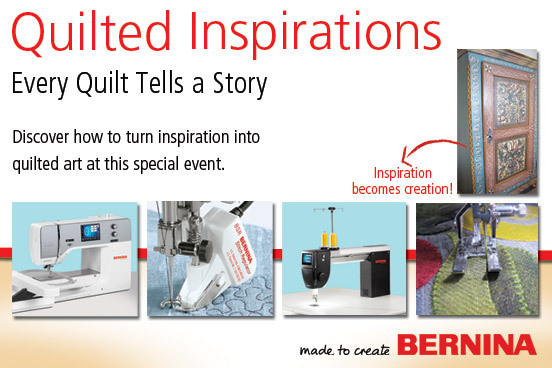 This is not exclusively for Bernina owners -- inspiration can strike anyone, no matter your machine of choice! Our class size is limited, so make sure you sign up as soon as you know you want to attend! We hope that you can join us!